• A common desire to see Damien navigate. 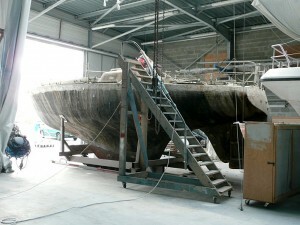 Fil info : The Grand Pavois International afloat boat show will be held from 19 to September 24, 2012 at the Port des Minimes in La Rochelle. More than 850 exhibitors are expected on 100,000 m2 of exhibition space. 300 boats will be exhibited afloat over 750 presentations at the show. Thematic areas are once again available to all visitors and Brazil will be the guest of honor at the 40th country. Reference for enthusiasts, the Grand Pavois offers a unique opportunity to try the boats at sea before purchasing. The Grand Pavois is in the top 5 international boat show afloat. They take off May 25, 1969 in La Rochelle on a boat out of cardboard drawing of a British architect, Robert Tucker. Going back to Spitsbergen in the Svalbard archipelago, they sail in the ice, joining Greenland then down the American coast to the West Indies. They run along the east coast of South America, reach Cape Horn sailing March 4, 1971, after ascending the Amazon over 2 000 kilometers. They will visit the sub-Antarctic Islands, South Georgia, Crozet, Kerguelen, Heard, Macquarie, join Tasmania, Australia, New Caledonia before crossing the Pacific against all winds and rally Tahiti. From there, they go down to Antarctica, berthed in the Arctic Circle, before returning to the South Shetland, South Georgia, Argentina and Brazil. A myth is born! September 22, 1973, pushed by a breeze from the west, Damien slips between the two towers of La Rochelle. A guard of honor is improvised. Enthusiasts, photographers, journalists are there. Jérôme Poncet even has his camera in hand to capture it back. Their world tour is finally over, 55,000 miles were swallowed and Damien slips into stride first Grand Bulwark, which then takes the 21au 24 September 1973 at the Port des Minimes. Gerard and Jerome are surrounded solicited commended for this achievement. A book in three volumes born this initiatory journey around the globe “Damien: Spitsbergen to Cape Horn” that mark the lives and minds of many browsers and future browsers circumnavigators future! Damien legend is born … “Leaving, will leave all barely out of adolescence, it was deliberately give a direction (a direction too) in his life, accept being ostracized, outcast for some, like the other ” Gérard Janichon. Facing the Grand Pavois in 1973 … and 2012! Damien is ill, sick … In summary, the boat is in bad shape. Also, it is in this state that will be presented at the Grand Pavois in Wood Village. No embellishment last minute, no “fig leaf” Damien will be presented in its current state to all of those he did dream. While some partners such as DRAC have already committed to participate in the restoration must today seek additional aid to private partners, but also launch an inclusive donation. Media side, no doubt that this project should have the response it deserves. The Grand Pavois engages therein! • Shell: Molded wood, mahogany 4-ply 5mm.